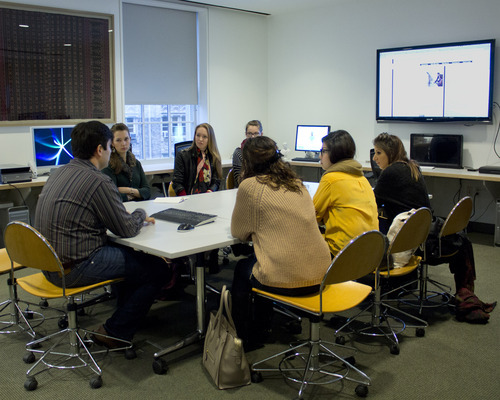 A group of fashion students from the Courtauld Institute in London were our guests in late January, as part of their annual January trip to New York City. Organized by their faculty member, Rebecca Arnold, this is the second visit we’ve had from our sister institute in London. The students had a tour of the Circus and the City exhibition, led by curator Matt Wittmann, and then spent an hour in our Digital Media Lab, with Kimon Keramidas, looking at some of our recent student projects, as they think about their own upcoming virtual exhibition assignments. They then joined our faculty and current MA students for tea and conversation in the sixth floor lounge. The afternoon was topped off by their joining us for our evening seminar series. We all enjoyed hosting our colleagues from London, and a special thanks goes to Nina Stritzler Levine for suggesting what we hope will continue to be a regular dialogue.